The 3 cup floor grinder differs from the direct drive floor grinder in that it is used for larger area floor grinding and levelling, as well as removal of concrete droppings, old tile adhesive or other inconsistencies. It is a less aggressive tool than the direct drive floor grinder. The 3 disk/cup floor grinder can be used to level a floor after the direct drive Floor grinder aggressively removed epoxy or glue using PCD cutters. Success with floor grinders depends on matching the application with the correct floor grinder and cutting tool i.e. grit of diamond or type of pcd cutter, for example the type of floor covering that needs to be removed, or the type & hardness of concrete differs with every application. This floor grinder comes fitted with 3 diamond cups that spins individually on the floor, fitted on one large disk that drives in one direction. The result is a nice level grind balanced by three contact points on the floor. 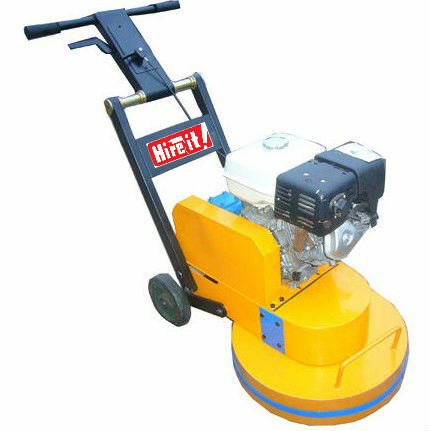 Fitted with a petrol engine, this floor grinder is suitable for outdoor or large well-ventilated area use, where electric power is not available. Number & size of Diamond Disks: 3 x 178mm Diamond Disks. Type of Diamond: 40# round grinding tips fitted on each disk.